The British word for the toilet, “loo”, derives from the French “guardez l’eau”, meaning “watch out for the water”. This comes from the fact that, in medieval Europe, people simply threw the contents of their chamber pots out the window onto the streets. 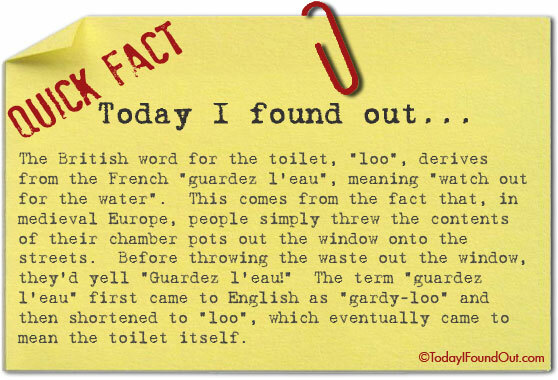 Before throwing the waste out the window, they’d yell “Guardez l’eau!” The term “guardez l’eau” first came to English as “gardy-loo” and then shortened to “loo”, which eventually came to mean the toilet itself. I am fully bi-lingual, in french and english. I might be wrong, but I’m quite sure that “Guardez l’eau” means “keep water”. @Bryan Campbell: Ah, but remember, in the context of that reference, we are talking French from the middle ages. This is a popular, but totally unsubstantiated story. The Online Etymology Dictionary doesn’t list it at all (but shows two other explanations) and the Oxford English Dictionary says the origin of the word is “unclear”. Their earliest citation is from 1922, which makes Medieval French extremely unlikely.